The LH530 thin and light notebook provides full desktop computer functionality in a stylish, portable and affordable package. With a large 14” display, runs for up to 4 hours on a battery charge, and weighs only 5.5 lbs. 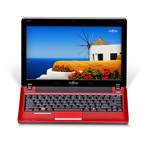 Students and SMB customers will appreciate its professional computing capabilities and attractive price tag. 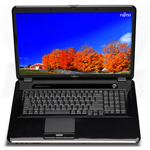 What offers state-of-the-art computing, multimedia, wireless technology, a bright 15.6 inch Wide Crystal View HD display, and can be yours at a reasonable price? The Fujitsu LIFEBOOK AH530 Notebook featuring Fujitsu quality you can depend on and stylishly packaged for those who want it all. The affordable LIFEBOOK PH520 offers the perfect combination of functionality and style in an ultraportable notebook. Despite its size, the LIFEBOOK PH520 offers features that are standard in larger notebooks, such as a good size keyboard, built-in webcam, and integrated high speed wireless-N. The LIFEBOOK PH520 is sure to enhance your computing experience wherever you go. 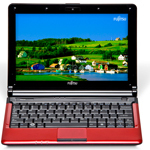 The full-featured LIFEBOOK NH570 notebook boasts an impressive 18.4-inch high resolution HD+ LCD. 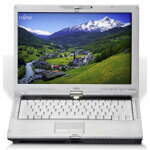 The NH570 makes a fantastic entertainment notebook and is capable of taking on the tasks of the most advanced desktop. Not only do you have the ability to easily view two documents side by side, but the large, high resolution LCD enhances your viewing experience regardless of whether you are looking at pictures, movies, or enjoying a game. With standard ports and media slots, coupled with Genuine Windows® 7 Home Premium, your notebook can now be an uncompromising media center. 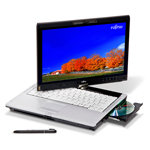 The LIFEBOOK TH700 features the latest dual digitizer technology with pen input and multi-touch interaction, modular bay, bi-directional display hinge, and the performance of all new 2010 Intel® Core™ processor technology. This is a do-it-all Tablet PC that is sure to simplify your internet surfing experience with the convenience of the touch functionality in either notebook or tablet mode. You'll wonder how you ever survived with just a notebook. 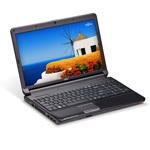 Receive a 2 Year Warranty Extension on the purchase of a LifeBook Notebook or Tablet PC. Plus FREE Shipping and a FREE Promo Item! Use Coupon Code FAWRNTYEXT. Valid from 4-12 through 4-23-10. Get $120 Off plus Free Shipping on Select Outlet Products from Fujitsu! Use coupon code OUTLETSALE. Prices are valid from 4/5/10 through 4/12/10. Get $120 Off plus Free Shipping on Select Outlet Products from Fujitsu! Use coupon code OUTLETSALE. Prices are valid from 4-5 through 4-12-10. MOTHER'S DAY SPECIAL: Purchase a new LifeBook P3010 Notebook and Receive a 250 GB USB Hard Drive or Lexmark All-in-One Printer, Free Shipping, No Payments for 6 Months, PLUS a FREE External USB DVDCD-RW Combo Drive. Valid from 4/26/10 to 5/7/10. 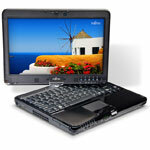 The LifeBook T4310 is the first Tablet PC to offer unmatched flexibility with a modular bay to home users. 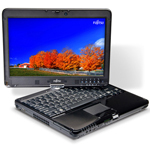 The LifeBook T4310 features the latest dual digitizer technology with pen input and multi-touch interaction, modular bay, bi-directional display hinge, and the performance of Intel® Core™ 2 Duo processor technology. This is a do-it-all Tablet PC that is sure to simplify your internet surfing experience with the convenience of the touch functionality in either notebook or tablet mode. You'll wonder how you ever survived with just a notebook. The LifeBook T900 raises the renowned lineage of Fujitsu Tablet PCs to new levels of smart performance with the new Intel® Core™ i7 Processor and Intel® Core™ i5 processor while continuing to offer traditional Fujitsu features such as built-in modular bay and bi-directional display hinge. The unmatched 13.3-inch display with 160 degree vertical and horizontal viewing angles and optional multi-touch screen provides the optimal combination to efficiently interact with on-screen applications. Whether you are using it as a conventional notebook or capturing important notes with the digital pen, the LifeBook T900 Tablet PC offers the ultimate in flexibility and mobile productivity. The LifeBook T1010 Tablet PC with Intel® Centrino® 2 Processor Technology , and 802.11a/b/g/draft-n. From its robust bi-directional hinge to its easy-to-navigate 13.3-inch display, the T1010 is intended to be the first affordable Tablet PC. Breeze through your applications using only your finger, create and watch DVD movies, sketch objects and scenes, and collaborate with others using the built-in webcam and microphone. "Mylo" Our Lives Online キャンペーン実施中!